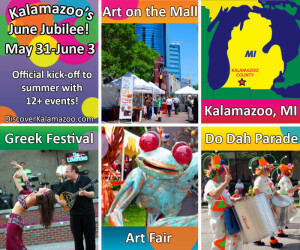 June Jubilee is the official kick-off to summer in Kalamazoo! This weekend features over a dozen different events held in the downtown area. Take a trip to Greece without ever leaving Kalamazoo at the 36th Annual Greek Festival, browse juried art work from over 190 artists at the Art Fair, enjoy a Concert in the Park, and take in the sights and sounds of Super Saturday, featuring the Kalamazoo Do-Dah Parade and Art on the Mall. Download the brochure and plan your route here. This is one weekend you don't want to miss! With so much going on, there's no way to fit it in to only one day. Plan your stay with any of our conveniently located hotels, motels or bed and breakfasts and enjoy every minute of fun! Click here to find the perfect place to hang your hat at night. May 31 – June 2 36th Annual Greek Festival. Arcadia Creek Festival Place. Spend three days in Greece without leaving Kalamazoo! Thirty six years ago it began with a small gathering of friends enjoying the Greek culture in the basement of Dionysos Restaurant, owned by Theo and Stacy. Today it is a three-day celebration of Hellenic pride, featuring authentic Greek food, spirits, music and dance, made possible by Theo’s family in his memory. Come raise a glass of Ouzo, and let us show the meaning of OPA! Thursday – Saturday, opens 11 am daily. Featured bands include Night Ranger on Friday and Hoobastank on Saturday. June 1 Art Hop & More. June's Art Hop & More! is the biggest of the year featuring 62 locations! Downtown…..and beyond…..galleries, businesses and stores will be filled with artwork by local artists. Art Hop events are free and open to the public! The artwork is for sale and artists are on hand to discuss their work. In addition to galleries, downtown will be filled with entertainment and events for the entire family! Beginning at 5 pm. June 1 Gazelle Sports Historic Walk. A 90-minute free walk that focuses on the architecture and history of South and John Streets. Meet at Gazelle Sports at 8 am. June 1 Kalamazoo Institute of Arts Beer Garden. 5:30 pm – 10 pm. Serving up Bell’s Beer, the popular Whiskey Before Breakfast Celtic band, and grilled food. June 1 Kalamazoo Institute of Arts Cruise-In. 5:30 pm – 8 pm. The first ever Vintage Car Cruise In at the Kalamazoo Institute of Arts. • A special Thursday night reception to unveil the fair’s commemorative T-shirt, with Speed Bump cartoonist Dave Coverly, who created the shirt. • The first-ever night Vintage Car Cruise In on Friday night. • An expanded Friday night Beer Garden at the Kalamazoo Institute of Arts, which serves up Bell’s Beer, the popular Whiskey Before Breakfast Celtic band, and grilled food. • Musical performers playing at small stages throughout the park on Friday and Saturday. June 1 – 2 Art on the Mall. Featuring over 90 artists from throughout the Midwest and local region, Art on the Mall has made a name for itself over the past 30 years. A softly juried show, original art product includes pottery, unique garden art, jewelry, drawings, paintings and mixed media. Booths are located on South Street and the Kalamazoo Mall to Water Street and the corner of Farmers Alley and South Street. Friday noon – 9 pm; Saturday 9 am – 5 pm. June 2 Do-Dah Parade. Downtown Kalamazoo. It's zany. It's wacky. And it's not your traditional parade. The Do-Dah Parade celebrates parodies and spoofs through great community organizational teamwork. For over 26 years, this parade has reigned the downtown streets with its unique absurdities. 11 am kickoff. June 2 Friends of the Kalamazoo Public Library Sidewalk Sale at the Kalamazoo Public Library. 9 am – 3:00 pm. Books for 10¢ each or $2 a bag full—what a bargain! Choose from thousands of books at the annual Friends of the Library sidewalk sale. Select from tables with more than 10,000 books sorted by category: fiction, mystery, romance, non-fiction, etc. Kids can browse carts full of children’s books. Everyone who buys a book at the sidewalk sale gets a coupon for a free bargain book from the Friends Bookstore, open from 9 am to 4 pm on June 2. June 2 First Saturday at KPL. Central Library. Take your family to the library for First Saturday! Enjoy games, crafts, puppets and special guest, storyteller Sid Ellis, Black Arts & Cultural Center executive director. Door Prizes! 2 pm – 4 pm. June 2 Philoptochos Ladies Society Greek Bake Sale & Luncheon. 507 S. Westnedge. 9 am – 1 pm. June 2 Ice Cream Social. Offering a variety of favorite flavors and pies available for sale. Enjoy these special summer-time treats in the beautiful historical building or outside on the patio on the relaxing grounds. Tours will be available. Hosted by the Ladies Library Association ( on Park Street – behind the Civic Theatre). 10 am – 2 pm. June 3 Concerts in the Park. Bronson Park. 4 pm. Kicking off the 2012 Concerts in the Park, join the Kalamazoo Singers as they present a variety of popular and patriotic musical selections. Offerings range from Broadway gems from Irving Berlin, show tunes by Rodgers & Hammerstein, plus fun selections from Gilbert & Sullivan operettas. Enjoy the vocal talents of some of Kalamazoo's finest singers under the direction of Rick Phelps and supported by pianist John Griffin.